Thank you for all your insightful comments on Monday’s post about 13 Reasons Why, Season Two. It was so great to read your thoughts, and have a dialogue about such an explosively controversial Netflix YA series. Well, I’m at the airport again. I booked another modeling job this week in Ohio, so I’m flying in for the shoot! But before I got on the plane, I wanted to share one of my classic recipes. Now let’s be honest…I love cooking and eating delicious food, but most days, I want to be in and out of the kitchen in 30 minutes or less. So this meal is quick and easy. And also warm and comforting. A combination that is hard to achieve in such a short time span. 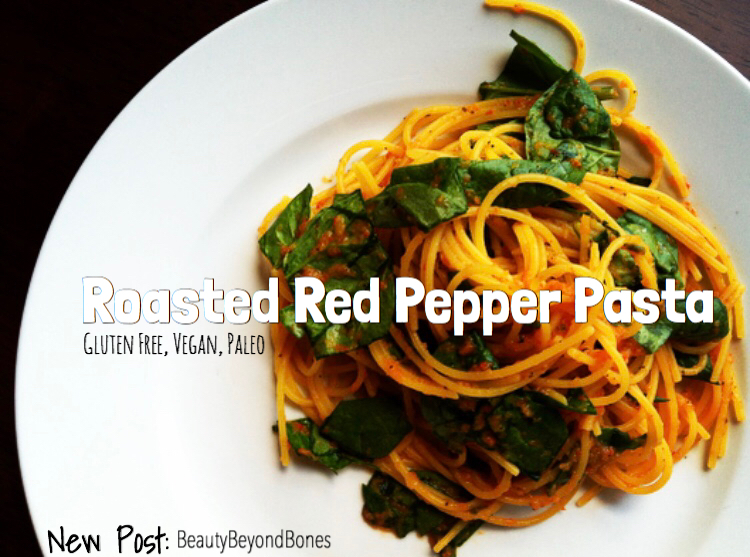 Enter my roasted red pepper pasta! A healthy, nutritious and flavor-packed plate of goodness! This pasta dish is Gluten Free, Paleo and Vegan, with a Specific Carb Diet option! To make this Specific Carb Diet legal, you’ll need to use zucchini noodles or butternut squash noodles. Both of which can be made with a spiralizer or mandoline slicer. In this recipe, I opted for the protein-packed, and paleo-friendly quinoa pasta. Before I adopted the Specific Carb Diet for my Ulcerative Colitis, it was my favorite gluten free pasta – even better than brown rice pasta! This was the brand I particularly loved. And one thing you’ll notice about this dish, is that it is tomato free! But I promise you won’t miss them at all! In fact, roasted red peppers are one of my favorite secret flavor superheroes. And after trying this dish, I think you’ll know why. Cook pasta according to package direction, reserving 1/2-3/4 cup pasta water. In the meantime, saute the onions in 1 Tbsp EVOO, with salt, pepper, and the spices. After about 3 minutes, add 3 cloves of garlic and allow them to cook for about 3 more minutes. Take off the heat, and add to your food processor, along with the chopped red pepper. Process until you get a thick and creamy sauce. Adjust salt to taste. Toss the pasta with your sauce, 1/2-3/4 cups of pasta water, and the spinach. This meal was just fabulous. It tasted right our of your grandmother’s Italian kitchen! It was slightly smokey-sweet, and so slurpy! It tasted wonderfully hearty and comforting with the warm oregano and basil. It was hard to believe the sauce was just a humble red pepper! And the spinach gave a nice green contrast — and come on, who doesn’t love spinach!? This instagram worthy meal is just what the doctor ordered after a long day! What’s your favorite pasta dish? Are you more of a red sauce, white sauce, or pesto kind of a pasta person? Next Post I’m on the Radio! I love this pasta dish! Especially with the quinoa noodles. I’ve been loving the different variations on noodles lately, such as the black bean and banza (chickpea) noodles. This looks wonderful! And simple, which is the best. 🙂 I’ll definitely have to try this! Nice move with the quinoa pasta, sneak a little protein in there. Nice. Haha you’re right about that! Once again Carolyn, you have such amazing food; it’s crazy 😁. Thank you so much for continuing to do this. Also, I tried to go onto the radio station to listen to your interview and it wasn’t there. Thanks for the good cooking ideas. Eating used to be one of my favorite things, even an obsession, but I’ve lost interest in recent years, and that hasn’t been a bad thing, weight-wise in particular. But reading through your recipe has made me hungry again! Though I think it would take a slow guy like me forever to get those ingredients and then cook them. It takes me 6 days to put together a kitchen island that the instructions say can be done in an hour. But thank you for the hunger. It makes me feel alive! LOL. hmmmm delicious, dear friend and I love also spinach (to get some forearm muscles like popeye LOL) – easy recipe – I will try out – thanks dear friend and a happy time to you. This looks delicious! I can’t wait to try!! Hiya! I love the look of this pasta. The pictures are STUNNING! As an aside though, a few months back I had commented on one of your posts about recovery and sharing a bit about my experience with mental health. It’s not something I wrote about on my blog explicitly before and you had encouraged me then to share my experience. So I did! And you’re quite the inspiration in that regard. Earlier, I had written about mental health, but privately. Now, I wrote something about depression, albeit not directly (a poem). I do credit my newfound bravado to your example and I would dearly love for you to have a read if you find the time. Yours is a great light, you’ve made a difference in my life. Thanks! Another aside, you really do make veggies look phenomenal! Haha. So, are you for real? How do you handle hot red pepper hot with all your digestive issues? I have enough of my own, and hot hot can damage me for weeks. it’s a sweet red bell pepper. i def can’t handle hot ones! omg this looks too damn delicious! Thank you for this! I really hate tomatoes & always try to find tomato-free pasta recipes that AREN’T alfredo for my Italian husband!